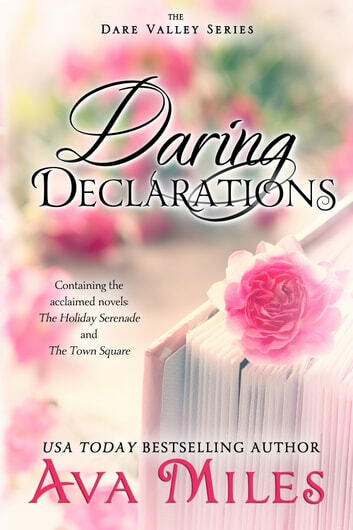 International Bestselling Author Ava Miles presents an anthology containing two sweet and uplifting novels, THE HOLIDAY SERENADE and THE TOWN SQUARE, guaranteed to melt your heart. Professional gambler and millionaire Rhett Butler Blaylock is everything Martha Stewart wannabe Abbie Maven doesn’t want in a man-flamboyant, flashy, and unreserved. After a horrible experience in her youth, she has spent her life trying to make all the right choices, pouring her energy into being the best possible single mother to her son. Rhett’s determined to show Abbie he can be the man of her dreams. As Christmas approaches, he prepares a special surprise for her, hoping the holiday will work its magic and grant him a miracle. Will his holiday serenade heal Abbie’s heart and convince her to give love a second chance? Arthur Hale returns to his hometown of Dare Valley, Colorado to start a new newspaper that will channel the voice of the West. But the bigger the dream, the higher the price. 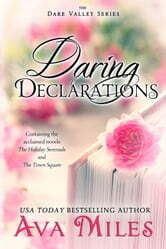 Arthur’s ambition and drive isolate him, and the only person who can break through his self-imposed solitude is Harriet Jenkins, his talented and mysterious secretary. What he doesn’t know is that Harriet Jenkins is actually Harriet Wentworth. A newspaper article ruined her father and sullied her family name, and now she’s out for revenge on the journalist who wrote it: Arthur Hale. Soon the impossible happens, and Harriet finds herself falling for the man she set out to destroy, but can the two build a future on a foundation of lies and ugly truths?